Captain Don and I love to dine at the fine restaurants along our beautiful Alabama and Florida Gulf Coast. Here are some of our favorites – We hope that some of them will become your favorites, too! Click on the name of each restaurant to be directed to menus and more information. Big Fish Restaurant and Bar – Owners Leck and Jana Lilayuva provide an excellent combination of fine food and top-notch service at this Orange Beach favorite. Fresh seafood at a reasonable price. Award-winning shrimp creations – (be sure and try Captain Don’s favorite – Holy Shrimp!) are the norm here Owner/Chef Leck won the 2010 Annual National Shrimp Festival Chef’s Challenge for his Lemongrass Mignotte Shrimp recipe. And if it is sushi you crave, Mimi will fix you right up with delicious Chili Garlic Sashimi and handmade sushi rolls. Specialty desserts such as the homemade gelatos are a real treat. You will always be greeted with a smile here – and leave with a big smile, too! The Hangout – The Hangout is more than a restaurant. It is a fun venue for beachgoers of all ages. 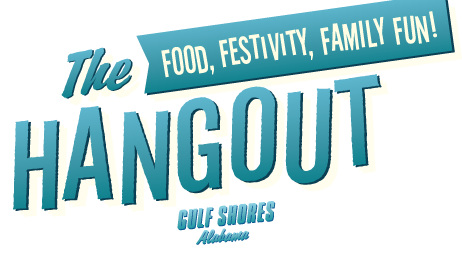 The Hangout is becoming internationally known for the Hangout Music Fest, now in its 4th year. Last year’s lineup features classic rockers Tom Petty and the Heartbreakers, along with many other acts. Generations of music fans representing all kinds of tastes in music gather for 3 days of sun, fun and music on the beach. Year round, you can enjoy traditional Gulf beach seafood fare – and enjoy the beach breezes in the open air. Gilbey’s – Gilbey’s is located in the Palm Pointe Plaza (aka Publix Shopping Center) along the beach road at 25775 Perdido Beach Blvd. This new favorite (opened in early 2014) offers great steaks and seafood, as well as other choices, such as pork chops or hoisin baby back ribs. On the last Thursday of the month, check out the 4- course wine dinners – only $35 a person. Daily specials are always good, and I love the Blackened Grouper with Crab Meat, or the Pan Seared Grouper. Ginny Lane Bar and Grill – This is Lane and Ginny’s first restaurant at The Wharf. Ginny Lane provides great salads, sandwiches, seafood, steaks, and more in a refreshing pub style atmosphere. You will love the BIG screen TV over the bar, and check out the local artwork that graces the walls – many works are for sale. Ginny Lane is known for its monthly Wine Dinners. and occasional live music. During the November Frank Brown International Songwriters’ Festival, you can catch some of the songwriters there. Sunday brunch is great, too – First mimosa is complimentary! PLAYA– Playa is located on east Canal Road, beside Sportsman’s Marina. It is a popular location for lunches and dinners, and boasts a separate bar area too. You can enjoy dockside dining outdoors or enjoy a waterfront view inside, too, as you watch the yachts glide in and out. It is always festive at Playa which makes it a great location for party or event dining. The menu offers plenty of seafood, steaks, burgers, salads, and more. They will even cook your fresh catch for you if you have just come in from a great Getaway Charters fishing trips. Captain Don and crew are lunch regulars here – and Playa has begun to Saturday and Sunday brunch too. Prepare for a leisurely meal – great food takes a bit of time to prepare. Cosmo’s – Cosmo’s Restaurant and Bar on Canal Road is a favorite among locals and visitors alike. You will see artwork featuring the restaurant’s namesake – Cosmo, the dog – throughout the restaurant. Enjoy music and dinner on the deck, or step inside when the weather is just a bit too warm. The Sesame Seared Tuna Salad is a favorite of mine, but there is a terrific menu full of variety and daily specials. Sushi is served here, too. If there is a wait to be seated – and there often is – enjoy relaxing in the bar area. Or walk around and explore the shops there. Cobalt – Staying at Caribe Resort? Cobalt is for you! Cobalt is a sister restaurant to Cosmo’s, and it is located just west of Caribe, the Resort. It is a simple walk for owners and guests at Caribe. Delightful Sunday brunch, soaring ceilings inside, outdoor dining, and terrific views of Perdido Pass here. The tuna – avocado appetizer is delicious. Watch the boats come and go, or come by boat yourself and dock just steps from your table. DeSoto’s Seafood Kitchen – A Gulf Shores tradition! DeSoto’s is owned and operated by locals, Chris and Rosemary Steele (who also happen to be our neighbors). Two blocks back from the state beach access near the “T” in Gulf Shores, DeSoto’s serves up great traditional seafood (Try my favorite, Shrimp Lover’s Platter) lunch specials, and their famous Hawaiian Ribeye steak. Easy walk from the beach – Their vegetables are great, too. The sweet potato casserole is a signature dish, and I love the fried green tomatoes. Recently REMODELED! The Gulf – A really unique place! Beach dining directly on the sands of our Gulf Beach. Located just west of Perdido Pass Bridge in Orange Beach (across from The Pass Condominiums), the Gulf offers a walk-up order window and spacious seating on the beach. Try one of their burgers – or a specialty salad. The menu isn’t vast, but on a clear day, it is a very special experience. There is a separate bar area, too. A word of warning – no indoor seating – so check the weather before you go. 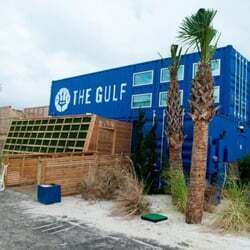 Read reviews of The Gulf here. Doc’s Seafood Shack – An Orange Beach tradition! Located at the T in Orange Beach (where Orange Beach Blvd aka Hwy 161 intersects Canal Road), this small oyster bar on Wolf Bay is well known for its oysters on the half shell, EXCELLENT gumbo, and fried delights. Anticipate a wait in the busy summer season. Have a seat at the bar and down a dozen and a cold beer while you wait, or you can always order takeout, too. Old-school beach shack atmosphere. Master Joe’s – Master Joe’s is fairly to Orange Beach, opening at the old Mexico Rock/Fish Camp location on Canal Road next to Sam’s in early 2015. But this new restaurant brought along a wonderful reputation from its Fairhope location. Fresh sushi, great wines,best miso soup EVER, and new dishes being added weekly to the menu in Orange Beach will make this a favorite very soon. Here is a secret: Few tourists venture down Canal Road east of Hwy 161 to look for great dining – so for now at least, you can avoid summer crowds and be served quickly.